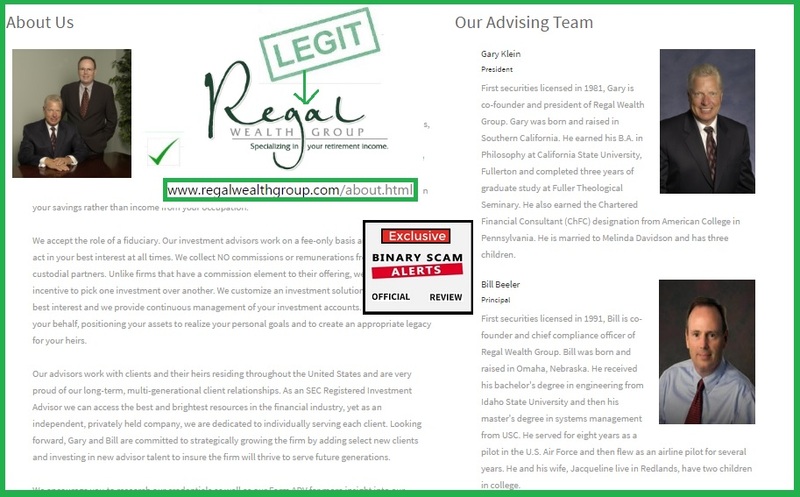 Binary Scam Alerts is posting an immediate SCAM and Blacklist notification in regards to the Regal Wealth Software, App, and Autotrader as well as Michael King and Dominic Ward the cheaters. Our extensive review uncovered a vile plot similar to the Hedge Fund Formula Scam. These liars plagiarized the name of a real company and tried to get a free ride based on account of their professional reputation. Luckily our team was sharp and caught these criminals red-handed. Strangely enough they infringed on a trademark belonging to a company specializing in the fiduciary process, which means it’s more than likely there are lawyers behind this firm. The fraudsters who produced this shameful SCAM risk getting sued now (I really hope this happens), and this is just for openers. We also reviewed the various elements of the scam, namely the presentation, software, accuracy levels, customer service, and transparency. This system failed our credibility test on all key parameters and we believe it to be extremely misleading and deceptive. There is nothing regal about this scheme, and the cheaters behind it are most likely less-than scrupulous marketers who will swear they are direct descendants of Queen Elizabeth if the deal is good enough. So after completing our extensive review and investigation our findings were unequivocal and very clear, we are dealing with a very dangerous binary options investment scam. Initially this system started out with Michael King who is supposed to be the “founder and CEO of the Regal Wealth trading group“. We checked out his public profile and looked for the company. Believe it or not Regal Wealth exists, however it is managed by Gary Klein and Bill Beeler, they actually have a company Facebook Page as well and check out as totally legit as you can see in the image below. However Michael King and Dominic Ward are ghosts without any social profiles and the people who hired them for the job are very nasty individuals who will stop at nothing to get their dirty little fingers on your hard-earned money. Even in the presentation Dominic is just a voice and imaginary character who simply takes over the staged environment and starts spewing lies at an incredible pace. The software itself is a rehash of the Hedge Fund scam and George Dalio, there is no possible way you can profit with this app and we advise you to simply leave it alone and find more credible means of investing. To top it all off, they are using a type of widget which alternates random photos and automatically produces fake testimonials using image bank actors and stolen internet photos. The image below illustrates how this is done and how deceiving it is. I believe there’s not much more that can be said, this is probably as bad as it gets in every possible way. These people have broken every rule in the book and proved to us they have no guilty conscience or any type of moral issues peddling this crooked piece of code. We are amazed at the sheer level of audacity these people have and extremely surprised by how they are not afraid to get a court subpoena based on every kind of internet fraud I can think of (including collusion and conspiracy to commit credit card fraud). This goes way beyond the usual inflated bank accounts and phony results produced by Photo Shop. I honestly believe not even the most sophisticated trading tools such as advanced candle sticks charting and bolinger bands on 60 second options will not help you achieve an acceptable win rate. It’s best you simply realize you have made a terrible mistake and collect whatever is left of your money. Not really, these people will charge you $250 for the software and it will be paid to the broker they recommend which may very well be unregulated and shady. Well we have mentioned Hedge Fund Formula, but also Amissio, Lie Detector, Drexel Code, Quick Cash System, Millionaire’s Blue Print, the Free Money System, Push Money App, Greenwood, Centument LTD, Million Dollar Challenge, and Perpetual are all dangerous and should be avoided at all cost so don’t say we didn’t warn you. Its getting to be inundating with the amount of requests we are getting for product endorsements, but we are refusing all of them at this point. Our recommended section offers the best systems only and we keep it updated on a daily basis. It’s not every day we see such a malicious SCAM like Regal Wealth and Michael King. This software, app, and auto-trader is simply criminal, there are no other words to describe it. There is not one thing I can see which is genuine, honest, or sincere about this system, or the people behind it. Our investigation has produced clear evidence of SCAM tactics and we are warning all our viewers and members to keep their distance from this despicable trading tool and use extreme caution if anyone you trust tries to offer it. Feel free to contact us through our Facebook group or YouTube Channel at any time for more updates.